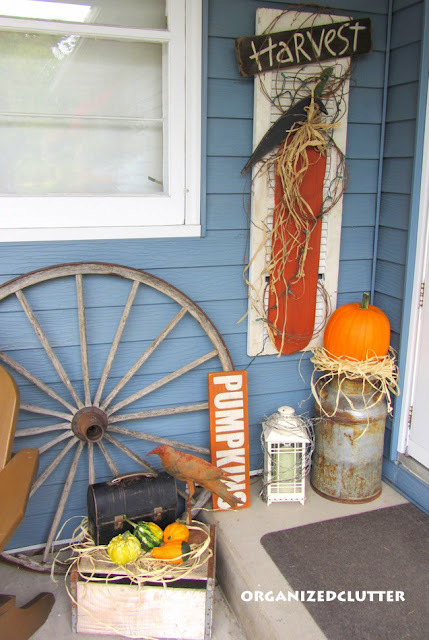 I am officially done with my fall and Halloween decorating for 2012. I plan to get a start on some Christmas crafting and projects very soon. 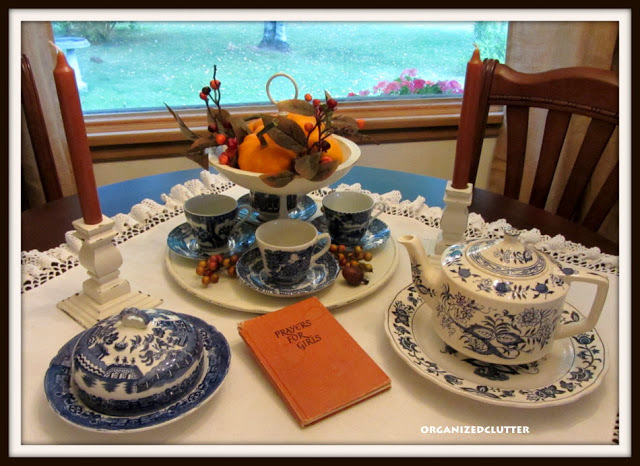 Fall Dining Table Vignette here. 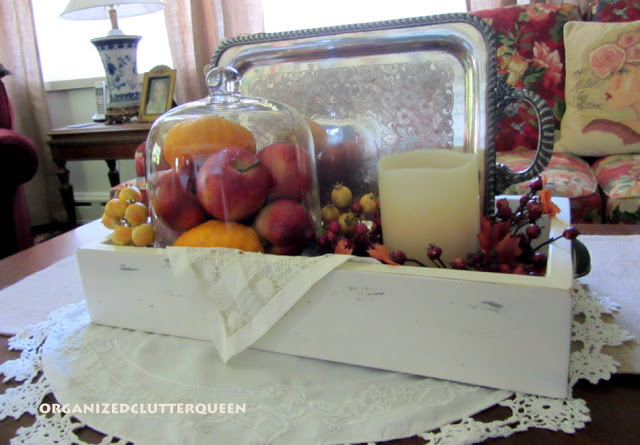 Fall Coffee Table Vignette here. 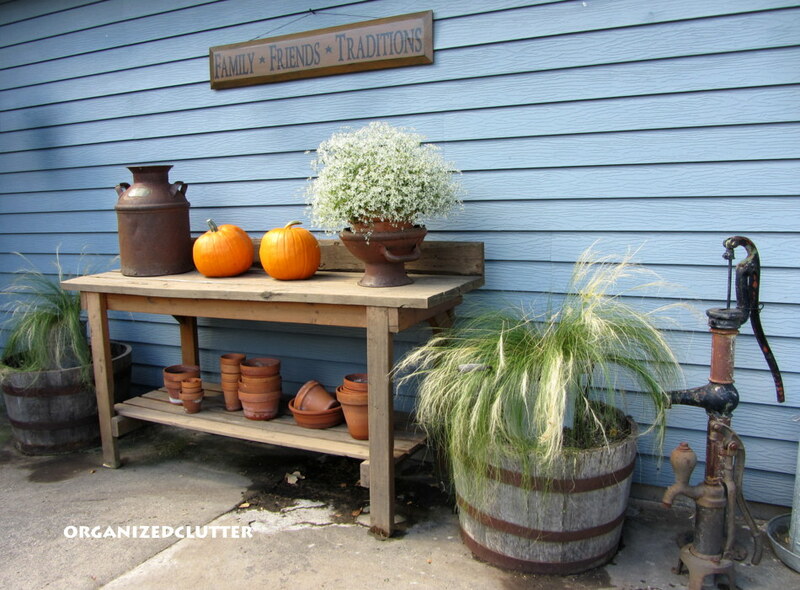 More Fall Outdoor Decor here. Pumpkin Head & Black Cats here. Crows, Pumpkins and Halloween Masks here. 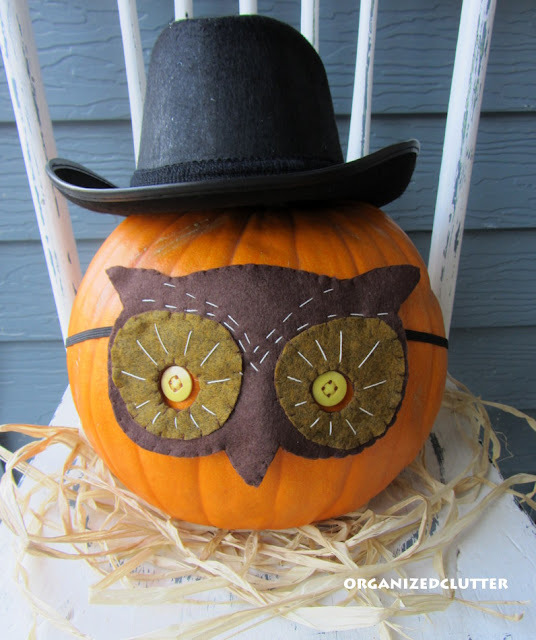 Owls and Googly Eyed Pumpkins here. 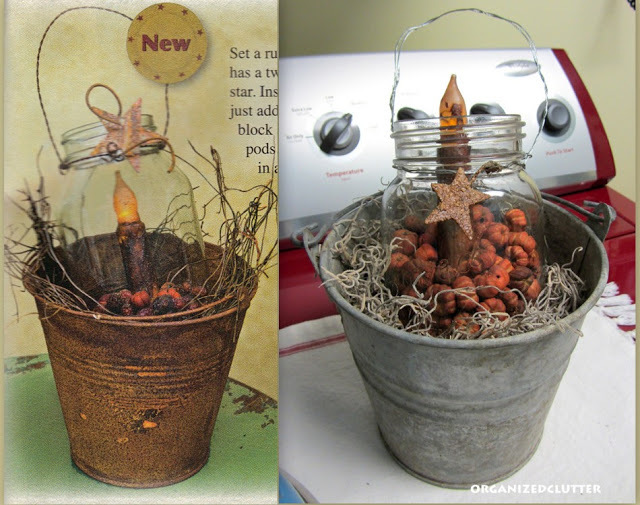 Fall Candle Jar Copycat here. Primping My Bike for Fall here. 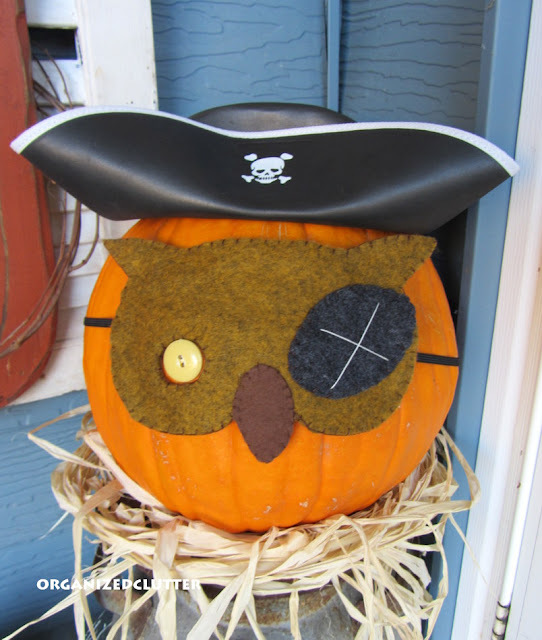 Owl Felt Masked Pumpkins (I made the masks) here. 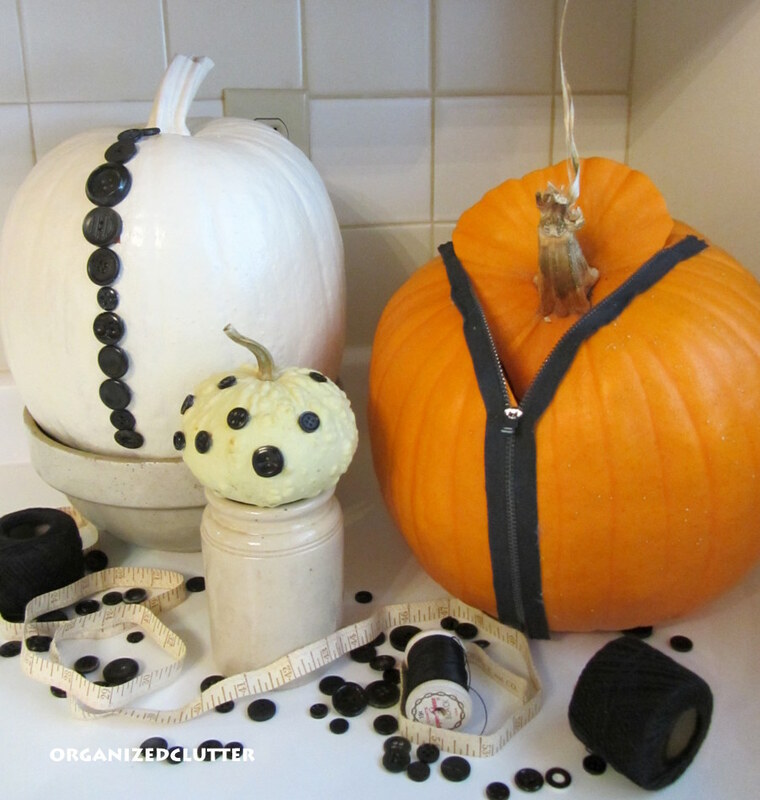 Sew Fun Pumpkins Copycat (my 10 cent zipper find) here. Faux Caramel Dollar Tree Apples here. 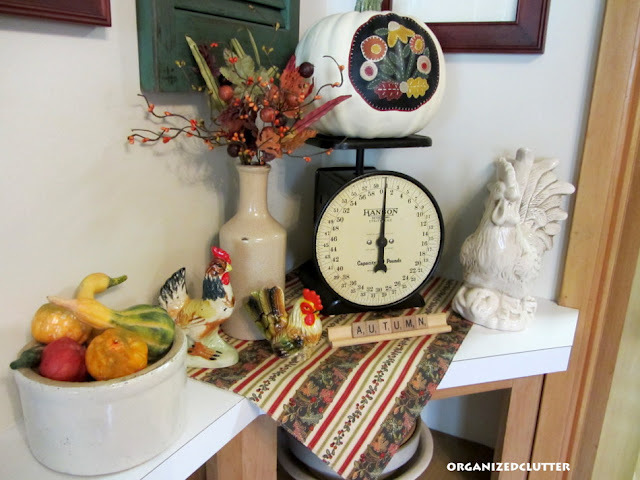 It seems like I was just starting fall decorating and now I'm all done! Joining Melissa at the Inspired Room. Oh Wow!!!! 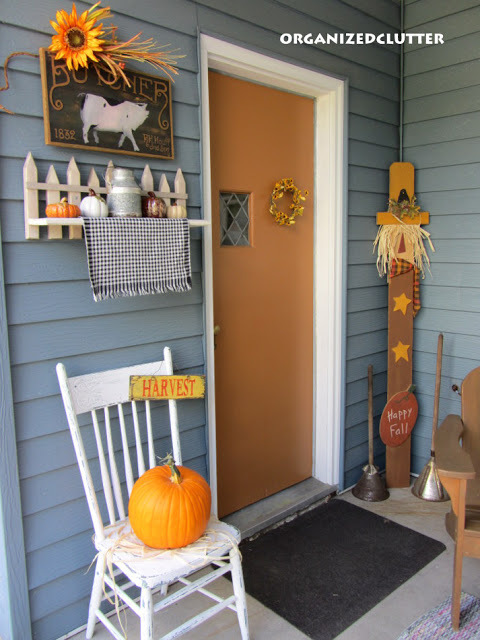 Carlene your home looks gorgeous for fall. 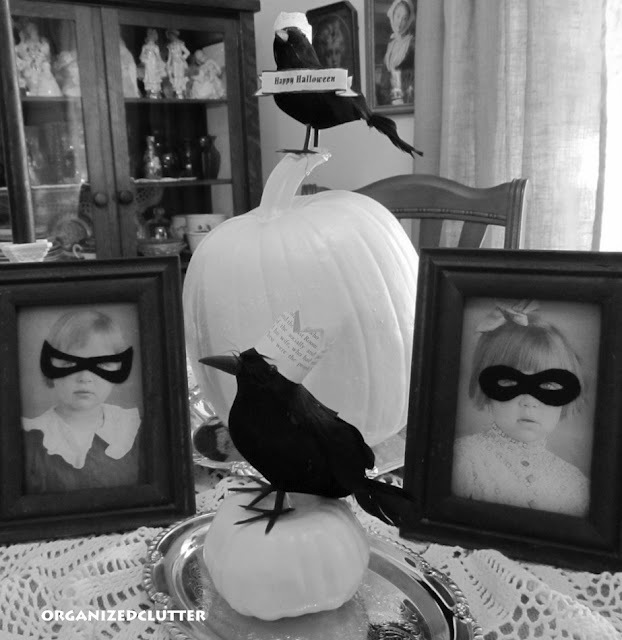 I love all your decorations and vignettes. The coffee table and suitcase vignettes are my favorites. Your outside is just as gorgeous, love the bike!!! Everything looks so festive! 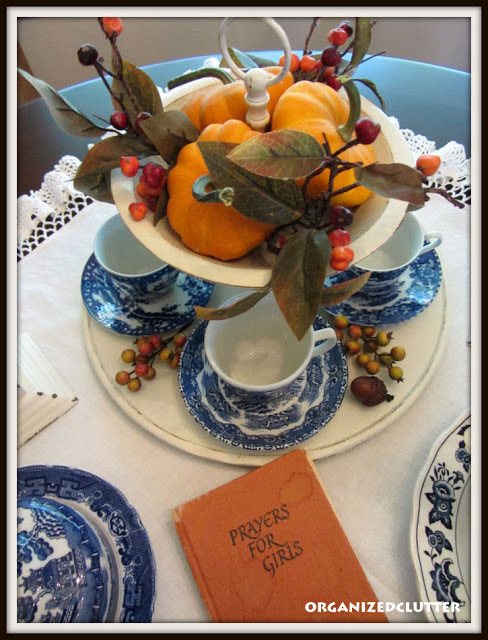 Especially attracted to your Fall table vignette with the blue dishes contrasted with pops of orange. Oh what eye candy! 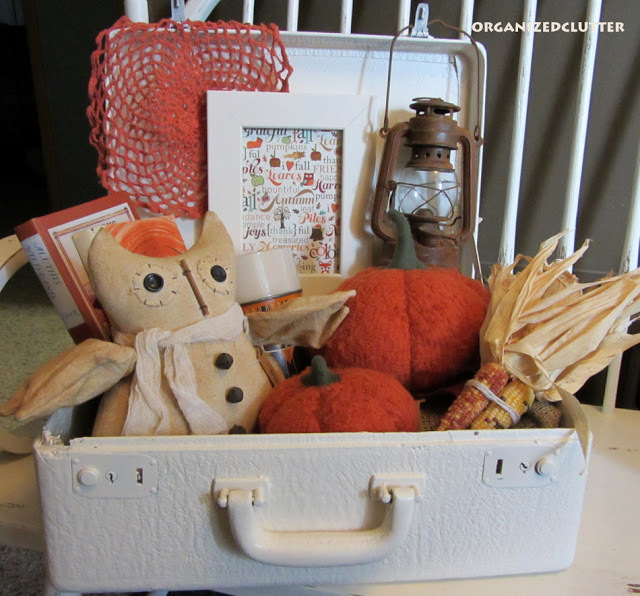 I still love that suitcase vignette & your shadow box. 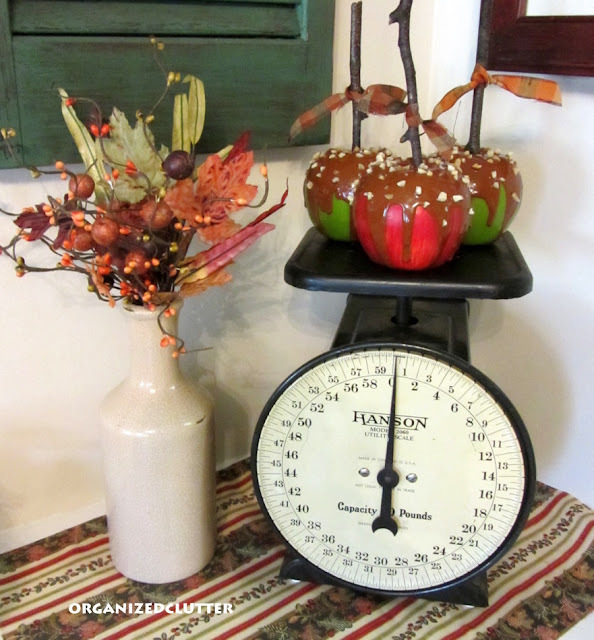 I am crazy for those faux caramel apples! 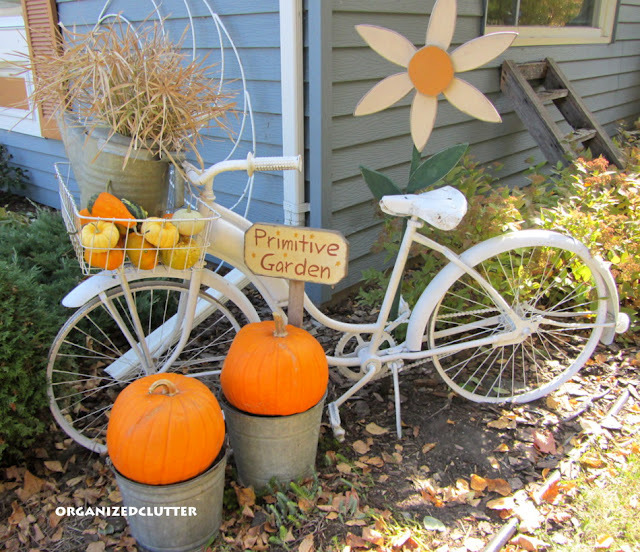 You have done some of the best fall decorations this year!! I'm ready to get home and do a few things for Thanksgiving and then move on to Christmas! Love all you owls! What a delight! 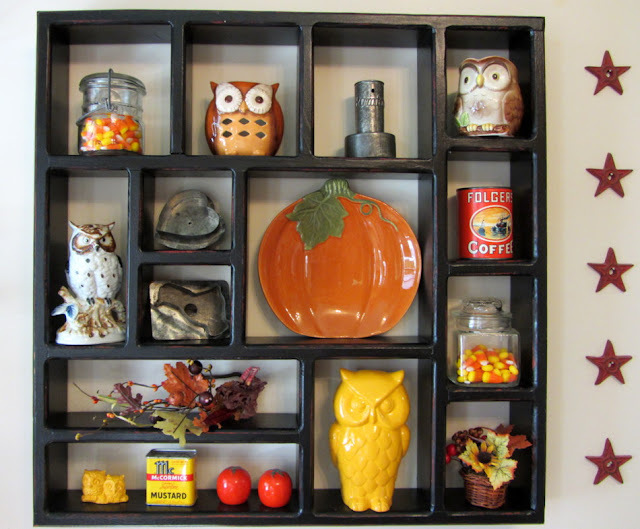 You've chocked this post with so much Fall goodness. 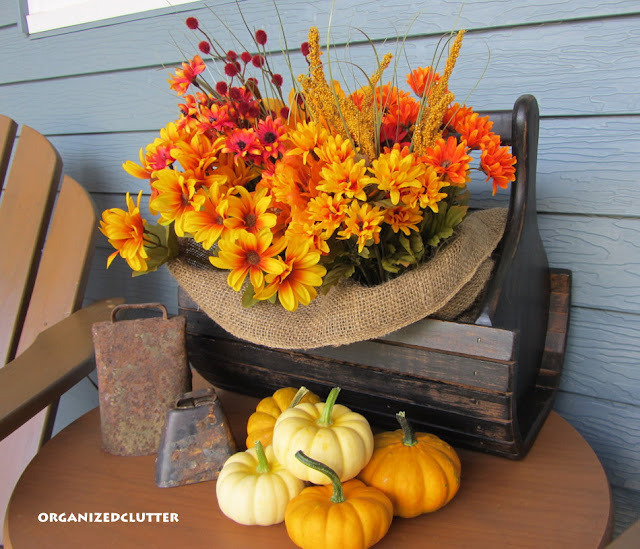 i love each arrangement...and, couldn't even begin to choose a fav! Everything looks wonderful! I really love the old lunch Box in that vignette. What a cute idea! Well I'd say you're ready for Halloween AND Thanksgiving! 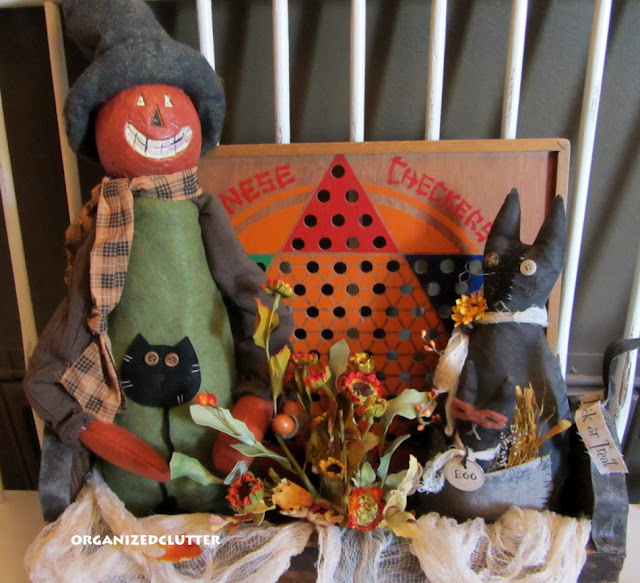 Everything looks so fun and festive at your house. 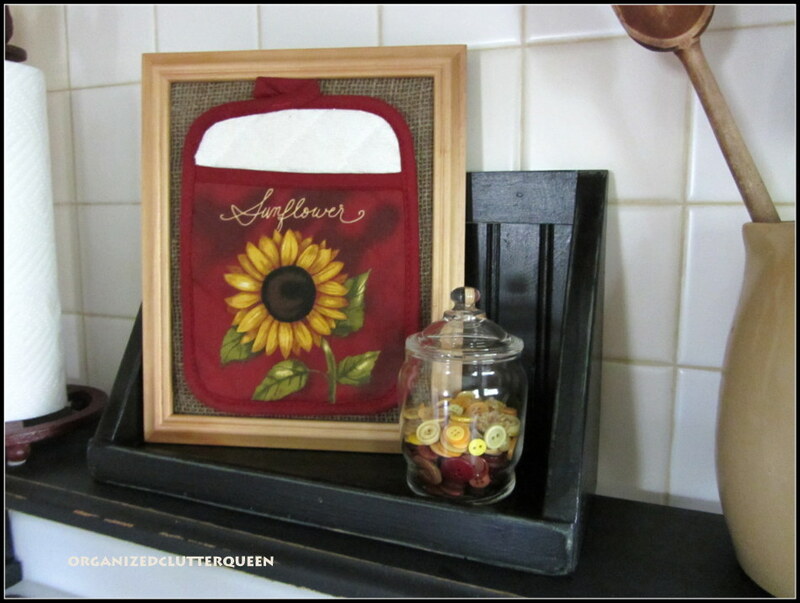 Carlene, you should be on a house tour for Fall....Everything is just fabulous. Love the old black lunchbox, the pumpkin with the zipper, your transfer and blue willow plates....golly....I loved it all! Perfect!!! Your vignettes are so much fun! It all looks fab!! 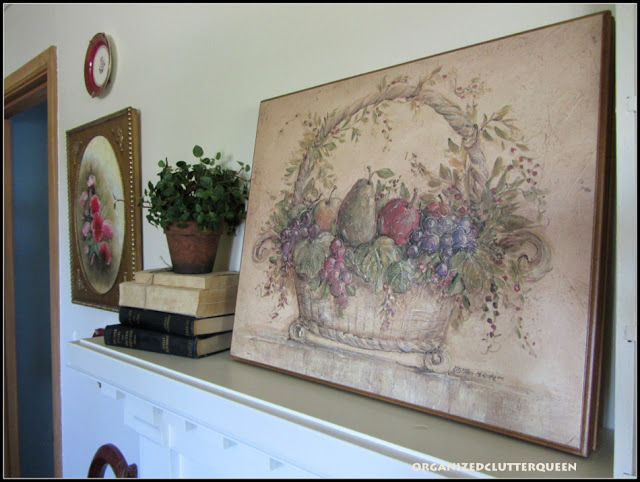 I love love that canvas of the fruit basket. The muted colors are awesome! Oh my gosh Carlene, I loved this recap. There were a few posts that i had missed. It's hard to pick a favorite because they are all fab! 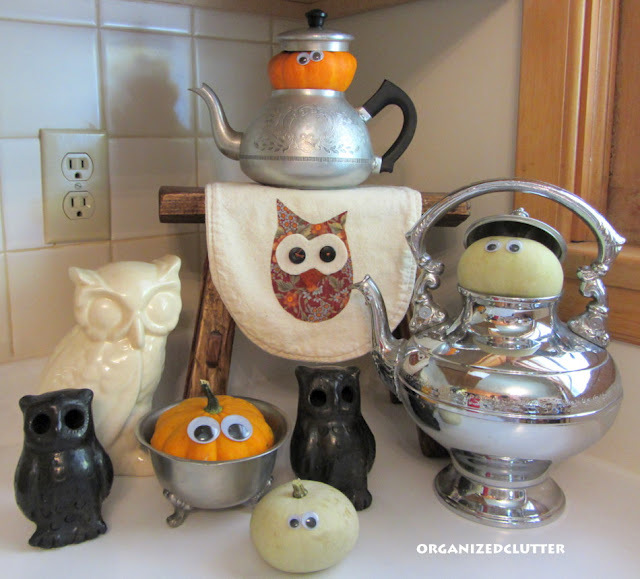 Love the suitcase, the scale vignette, the owl masks, oh what the heck, just love all of them. Little miss creative you! Thanks for sharing with SYC. But wow, what a lot of decorating you did! Do you ever go back and look and think, oh, I forgot I did that, and that, and that? You've been busy. Sounds like you are going to continue that trend for some time. Hard to believe we are only two months from Christmas. Time sure flies. Good idea to get at the projects. I always want to start in August but life gets in the way. 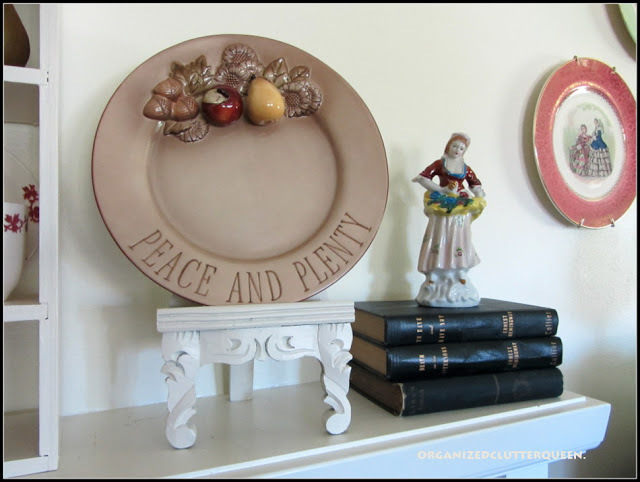 All of your decorations and vignettes are just amazing!! 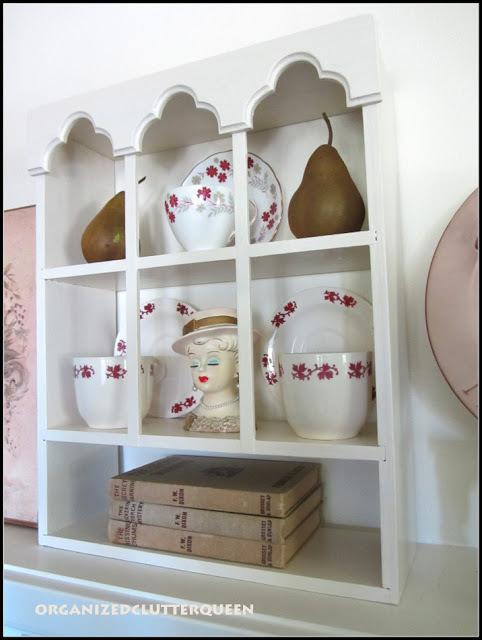 You have a knack for being able to put things together in such a delightful way!! Great job and such a joy to look at!! Carlene, I will be featuring you again at Share Your Cup. I loved all of your wonderful vignettes. You are so talented! OMGosh Carlene! You have been one busy girl! 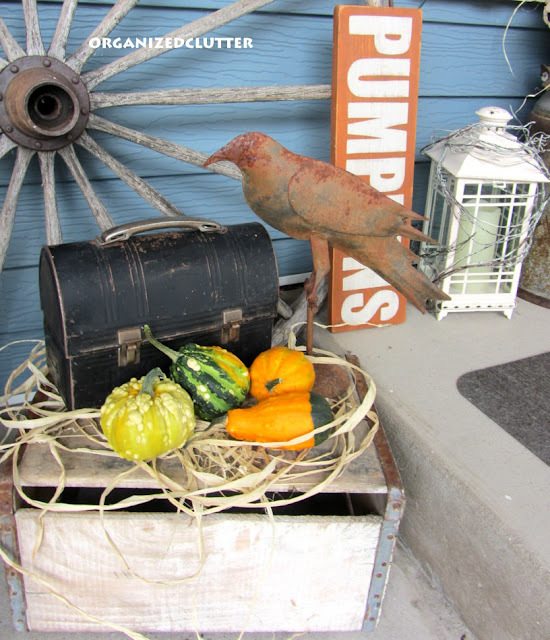 So many great Fall vignettes and so much inspiration.Love the cute woolly pumpkins in the suitcase and that great metal crow. Thanks for all the ideas. I need to get busy.